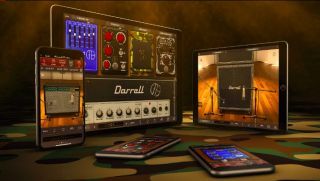 IK Multimedia has announced that its Dimebag Darrell CFH Collection is now available inside AmpliTube for iPhone and iPad. The collection, which models the exact gear used by Dimebag to record Pantera's classic 1990 album, Cowboys from Hell, was developed in conjunction with Dime’s longtime guitar tech and right-hand man, Grady Champion, and carefully models all the personal guitar effects, amplifiers and cabinets Dime used in the studio while recording the album. For more information, head over to IK Multimedia.